Included with both the AquariCam and OceanCam sytems in standard lengths of 50 feet or 100 feet. The system may employ a PoE power supply (PoE injector). A standard Ethernet Cat5 network cable connects to a local area network (router) and then to the Internet. and safely deployed. 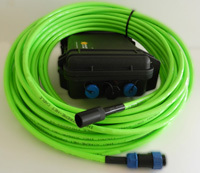 An optional waterproof power box is also available. 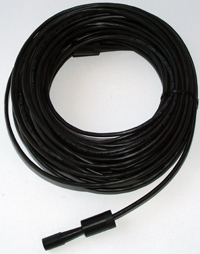 The Hybrid Cable is the perfect compliment to any of the OceanCam systems with or without lighting. The cable can be configured to support data+power or PoE (Power over Ethernet) over a single cable. Specially formulated with high-grade polyurethane, the outer sheath has an extremely high abrasion resistance and a low coefficient of friction that affords more protection against the harsh conditions of the open ocean. It is available in lengths of 50 and 100 meters. Armored versions using braided stainless steel or double served steel may be special ordered.